Although Weinberg favors permanent HLW storage, he is a proponent of temporary, monitored, retrievable storage for the first one hundred years that the waste exists. Hence, his position is significantly opposed to that of U.S. government officials who are pursuing immediate permanent disposal. Believing that Weinberg's proposal has more merit than that of the DOE and the NRC, we argue in this chapter for above-ground, temporary management of HLW in negotiated, monitored, retrievable storage (NMRS) facilities for approximately one hundred years. At the end of that time, we can reexamine the uncertainty and inequity issues (discussed in earlier chapters of this volume) associated with permanent repositories. We argue, therefore, for using NMRS for a century, then making a decision about geological disposal. This is a wait-and-see position. Wait and see if we can develop more resistant copper canisters. Wait and see if we can prevent water from generating colloids and leaching waste from borosilicate glass. 10 Wait and see if we can devise a way to render radioactive materials less harmful. Wait and see if we can resolve some of the uncertainty and inequity problems treated earlier in this volume. At least part of the rationale for our "wait-and-see" attitude is the belief that science, especially science in the public interest, ought to be conservative. Conservative science, as I. S. Roxburgh put it, makes it prudent to assume that if high-level radwastes are buried, then groundwater will eventually come into contact with them. 11 And if groundwater will come into contact with them, then it makes sense to use the long-term copper canisters, as the Swedes do, and to defer permanent disposal until we are certain that we can deal with the problem of groundwater intrusion. Knowing the uncertainties and inequities involved in our imposing nuclear wastes on future generations (see the previous chapters), the most rational and ethical course of action is to strive to limit both the uncertainty and the damage resulting from our actions. As A. Bates puts it: "Having recognized the fundamental unfairness of inflicting injury upon the innocent and unrepresented people of the future, we can only, in fairness, strive to limit the damage to the full extent of our natural abilities." 12 This chapter presents one option for limiting the uncertainty and damage from high-level radioactive waste: NMRS. 13 Our discussion of NMRS is not comprehensive, because the posal. Nevertheless, our argument is developed enough to show that there are probable alternatives to permanent disposal. After presenting a summary of one important alternative means of high-level waste management, negotiated monitored retrievable storage facilities (NMRS), the chapter outlines the basic arguments in favor of NMRS. The third and final section of the chapter evaluates some of the main objections that can be raised against NMRS. Minimize scientific uncertainty by delaying the decision about permanent disposal and by creating technically qualified, multiple NMRS facilities. Each of these will begin accepting spent fuel, for temporary storage, with storage periods and amounts set by legal limit. Maximize methodological soundness in NMRS site studies and maximize disclosure, understanding, and consent by funding and creating independent technical and financial capabilities, as well as independent review committees in host communities. All these independent groups should be funded by the beneficiaries of nuclear power and be able to help the host community negotiate with government officials regarding HLW site selection, operation, monitoring, and maintenance. Minimize human and institutional errors in site selection by using a lottery to eliminate qualified NMRS sites. Following the discussion of risk distribution in chapters 5 and 8, we have two suggestions for alleviating inequity. Spread the geographical risk and maximize regional equity by developing a number of regional NMRS facilities. Guarantee full liability, now and in the future, for all nuclear and waste-related accidents, deaths, and injuries. Maximize voluntariness and consent by compensating proposed host communities for the NMRS, even before the communities begin negotiating regarding the terms under which they might accept the NMRS facilities. Shrader-Frechette looks at current U.S. government policy regarding the nation's high-level radioactive waste both scientifically and ethically. What should be done with our nation's high-level radioactive waste, which will remain hazardous for thousands of years? This is one of the most pressing problems faced by the nuclear power industry, and current U.S. government policy is to bury "radwastes" in specially designed deep repositories. K. S. Shrader-Frechette argues that this policy is profoundly misguided on both scientific and ethical grounds. Scientifically—because we cannot trust the precision of 10,000-year predictions that promise containment of the waste. Ethically—because geological disposal ignores the rights of present and future generations to equal treatment, due process, and free informed consent. Shrader-Frechette focuses her argument on the world's first proposed high-level radioactive waste facility at Yucca Mountain, Nevada. Analyzing a mass of technical literature, she demonstrates the weaknesses in the professional risk-assessors' arguments that claim the site is sufficiently safe for such a plan. We should postpone the question of geological disposal for at least a century and use monitored, retrievable, above-ground storage of the waste until then. Her message regarding radwaste is clear: what you can't see can hurt you. 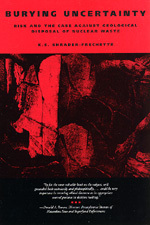 K. S. Shrader-Frechette is Distinguished Research Professor of Philosophy at the University of South Florida and is the author of twelve books including Risk and Rationality (California, 1990).